How do you define a social activist? Is it a person who screams and scrutinizes the government and the legal procedures at every possible opportunity he or she receives? Or a pacifist who loves to stage demonstrations with placards bearing messages of societal disorders? Or is it perhaps a stupid attention-seeking blogger like me who loves to write about things that worries him or premonitions of plagues that frighten him? I guess the answer is quite difficult to obtain. The definition is so abstruse that you might as well confuse a social outcast with a social activist. I like to think that a social activist is one who dares to think differently about the society. So that is, a way of saying that a social activist is a pariah, a person who has been exiled from the world of the norms. A social activist is one who cannot refrain himself from doing something after seeing all the wrongdoings happening around him. He fears the truth—the ultimate future–and he yearns time to stop, which pragmatically is impossible unless and until you are a physicist who can conjure up hypothetical situations out of every realistic medium. The world of truth to him is an object of ridicule and he dwells in a world that thrives on his very own dreams and philosophies. Thus gradually he gets separated from the society and with time the magnitude of this separation becomes so huge that it finally makes him an outsider in his society. Thus being a social activist is not a very easy life. The fact that you are living in a verisimilitude completely different from the one you nurture makes you at times tired. The fact that despite how much you try nothing at all is actually under your control will distress you forever in your life. But perhaps most importantly the fact that most of the time you will have to conform to the reality that you are a failure will overpower the sanguine monster inside you and foster the tree that thrives on pessimism. Perhaps one of the greatest ironies of life is that when you want something really hard you do not get it. Instead you get something which, when you later on think about it, you will realize was much greater in magnitude and more appropriate for you. Today Steve Jobs who is all set to retire while being at the zenith of his career can tell you about the truth of those words more than anyone else. The Silicon Valley magnate Steve Jobs, CEO of Apple Corporation, is an inspiration for millions of people across the globe, and for young people like me who are just about to set out into the harsh pragmatic arena of life he is a fairy tale. His ability to raise a firm from bankruptcy to soon-to-be the world’s first trillion-dollar worth company within a span of around 15 years only will be talked about in the business world for generations to come. Not only is he a living example of diligence & creativity, his ability to appeal to the aesthetic senses of the general public is a quality many of us would like to possess and nurture. Not only did he show the world that by excellent marketing skills and innovative technology any salesman can create a mark, he also demonstrated how the common people who may not necessarily be connoisseurs of art are prepared to spend a fortune if the product is at its best. However in my opinion, the most important lesson Steve Jobs gave us was in his commencement speech at Stanford in the year 2005———to think beyond the horizons and never let dogma overwhelm you. His words about ‘having the courage to follow your heart and intuition’ and building yourself into an autodidact echo in my ears every time I begin a new task. He successfully showed the world that systematic education is nothing but a process. The real lessons of life have already been genetically programmed into your cells by Nature. It is your responsibility to utilize those powers that you already possess. 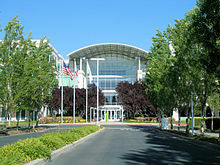 Today when he retires, Apple Inc will not have to look back ever again because the legacy that this great man had left behind, the examples of hard-work, far-sightedness, integrity and business-mindedness he had instilled into the hearts of his fellow-workers at Apple will remain as long as long as the company persists. Moreover although for us the retirement came as a surprise, the Apple employees must have been aware of everything because their CEO was battling constantly against a rare form of pancreatic cancer since the past few years—-the very reason why the company directors have had enough opportunities to be assured about the replacement Tim Cook. Let us use this occasion to revere this demigod of the 21st century. Let us acknowledge the power of one Steve Jobs who has taught the world to dream and work towards making those dreams come true. Thanks to this man for proving that time and hard-work one day gives you everything that is due to you, for showing us that our greatest dreams do in fact come alive and also that it is our responsibility to learn to live with frightful nightmares and then finally convert them into the most cherished dreams. No wonder that The Economist has named him the ‘Minister Of Magic’.